Part of City of Winnipeg Historical Photographs. Photograph shows parade and horse-drawn fire engine. Part of City of Winnipeg Historical Photographs. 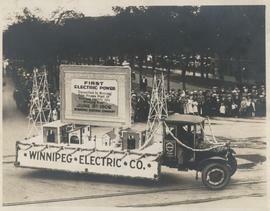 Photograph shows parade and D. E. Adams Coal Company Ltd. float.